The Provisions of Oxford are often regarded as England's first written constitution (although the Magna Carta and earlier law codes such as that of King Ethelbert of Kent are also significant). Installed in 1258 by a group of barons led by de Montfort, the provisions forced King Henry III of England to accept a new form of government in which power was placed in the hands of a council of twenty-four members, twelve selected by the crown, twelve by the barons. The twenty-four members selected were to pick two more men to oversee all decisions. The selected men were to supervise ministerial appointments, local administration and the custody of royal castles. Parliament, meanwhile, which was to meet three times a year, would monitor the performance of this council. A written confirmation of the agreement was sent to the sheriffs of all the counties of England in Latin, French and, significantly, in Middle English. The use of the English language was symbolic of the Anglicization of the government of England and an antidote to the Francization which had taken place in the decades immediately before. The Provisions were the first government documents to be published in English since the Norman Conquest two hundred years before. The 1258 Provisions had a significant effect upon the development of the English Common Law system. In and after the reign of Henry II the number of available 'writs' (causes for legal action in the common law courts in London) had grown. This expansion of jurisdiction by the royal courts aroused so much resentment that the 1258 Provisions of Oxford provided that no further expansion of the writ system would be allowed. These texts are not complete but are the fullest we can find. It has been provided that from each county there shall be elected four discreet and lawful knights who, on every day that the county [court] is held, shall assemble to hear all complaints touching any wrongs and injuries inflicted on any persons by sheriffs, bailiffs, or any other men, and to make the attachments that pertain to the said complaints [for keeping] until the first arrival of the chief justiciar in those parts: so that they shall take from the plaintiff adequate pledges for his prosecution [of the case], and from the defendant for his coming and standing trial before the said justiciar on his first arrival; and that the four knights aforesaid shall have all the said complaints enrolled, together with their attachments, in proper order and sequence — namely, for each hundred separately and by itself — so that the said justiciar, on his first arrival, can hear and settle the aforesaid complaints singly from each hundred. And they shall inform the sheriff that they are summoning all his hundredmen and bailiffs before the said justiciar on his next arrival, for a day and a place which he will make known to them: so that every hundredman shall cause all plaintiffs and defendants of his bailiwick to come in succession, according to what the aforesaid justiciar shall bring to trial from the aforesaid hundred; also as many men and such men — both knights and other free and lawful men — as may be required for best proving the truth of the matter. [This, however, is to be done] in such a way that all are not troubled at one and the same time; rather let [only] as many come as can be [used in cases to be] tried and concluded in one day. Fifteen men, of whom eleven were of the twenty-four named above. The twelve on the king's side have chosen from the twelve on the side of the community the earl Roger Marshal and Hugh le Bigot. And the party of the community has chosen from the twelve who are on the side of the king the earl of Warwick and John Mansel. And these four have power to elect the council of the king; and when they have made the election, they shall designate those [elected] to the twenty-four. And that shall hold on which the majority of these [four] agree. These are the twenty-four appointed by the community to consider aid for the king.... And if any one of these cannot or will not be present, those who are present shall have power to elect another in his place. Concerning the state of Holy Church: — It should be remembered that the state of Holy Church is to be amended by the twenty-four chosen to reform the state of the kingdom of England — at what time and place they think best, according to the powers that they hold by writ of the king of England. Concerning the chief justice: — [It has been decided] furthermore that a chief justice — or two [chief justices] — shall be appointed; also what power he shall have; and that he shall be [in office] for only one year, so that at the end of the year he shall render account of his term before the king and the royal council and before the man who is to follow him [in office]. Concerning the treasurer and the exchequer: — The same [has been decided] with regard to the treasurer; so that he shall render account at the end of the year. And according to the ordinance of the said twenty-four, other good men are to be appointed to the exchequer, whither all the issues of the land are to come, and not elsewhere. And let that be amended which seems in need of amendment. Concerning the chancellor: — The same [has been decided] with regard to the chancellor; so that he shall render account of his term at the end of the year, and that merely by the king's will he shall seal nothing out of course, but shall do so by [the advice of] the council that surrounds the king. Concerning the power of the justice and of the bailiffs: — The chief justice has power to redress the misdeeds of all other justices, of bailiffs, of earls, of barons, and of all other people, according to the rightful law of the land. And writs are to be pleaded according to the law of the land in the proper places. And [it has been decided] that the justices shall accept nothing unless it is a present of bread and wine and like things: namely, such meat and drink as have been customarily brought for the day to the tables of the chief men. And this same regulation shall be understood [to hold] for all the king's councillors and all his bailiffs. And [it has been ordered] that no bailiff, by virtue of his office or of some plea, shall take any fee, either by his own hand or in any manner through another person. And if he is convicted [of so doing], let him be punished; likewise the man who gives [the fee]. And the king, if it is suitable, shall give [fees] to his justices and to his people who serve him, so that they shall have no need of taking anything from others. Concerning the sheriffs: — As sheriffs there shall be appointed loyal persons, good men who are landholders; so that in each county there shall be as sheriff a feudal tenant of the same county, who shall well, loyally, and justly treat the people of the county. And [it is ordered] that he shall take no fee; that he shall be sheriff for no more than a year in all; that during the year he shall render his accounts at the exchequer and be responsible for his term [of office]; that the king, from the royal income, shall make [allowance] to him in proportion to his receipts, so that he may rightly keep the county; and that he shall take no fees, neither he nor his bailiffs. And if they are convicted [of such wrongdoing], let them be punished. It should be remembered that, with regard to the Jewry and the wardens of the Jewry, such reforms are to be established as shall carry out the oath in this respect. Concerning the escheators: — Good escheators are to be appointed. And [it is ordered] that they shall take nothing from goods of deceased persons whose lands ought to be in the king's hands; but that, if a debt is owing to him, the escheators shall have free administration of the goods until they have carried out the king's wishes — and this according to the provision in the charter of liberties. Also [it is ordered] that inquiry shall be made concerning the misdeeds committed there by escheators, and that redress shall be made for such [wrongs]. Nor shall tallage or anything else be taken, except as it should be according to the charter of liberties. The charter of liberties is to be strictly observed. Concerning the exchange of London: — It should be remembered to establish reforms touching the exchange of London; also touching the city of London and all the other cities of the king, which have been brought to shame and ruin by tallages and other oppressions. Concerning the household of the king and queen: — It should be remembered to reform the household of the king and queen. Concerning the parliaments, as to how many shall be held annually and in what manner: — It should be remembered that the twenty-four have ordained that there are to be three parliaments a year: the first on the octave of St. Michael, the second on the morrow of Candlemas, and the third on the first day of June, that is to say, three weeks before [the feast of] St. John. To these three parliaments the chosen councillors of the king shall come, even if they are not summoned, in order to examine the state of the kingdom and to consider the common needs of the kingdom and likewise of the king; and by the king's command [they shall come] also at other times, whenever it is necessary. So too it should be remembered that the community is to elect twelve good men, who shall come to the three parliaments and at other times, when there is need and when the king and his council summon them to consider the affairs of the king and the kingdom. And [it has been decided] that the community shall hold as established whatever these twelve shall do — and this is to reduce the cost to the community. Fifteen are to be named by these four men — that is to say, by the earl Marshal, the earl of Warwick, Hugh le Bigot, and John Mansel — who have been elected by the twenty-four to name the aforesaid fifteen, who are to form the king's council. And they are to be confirmed by the aforesaid twenty-four, or by the majority of those men. And they shall have the power of advising the king in good faith concerning the government of the kingdom and concerning all matters that pertain to the king or the kingdom; and of amending and redressing everything that they shall consider in need of amendment or redress. And [they shall have authority] over the chief justice and over all other people. And if they cannot all be present, that shall be firm and established which the majority of them shall enact. Preceding the Provisions of Oxford there had been the Petitions of the Barons (spring 1258) and the Provisions of the Barons (probably summer 1258). Reform was first officially granted by the King in the Letters Patent (charters) of May 2, 1258. Following the Provisions of Oxford the reformers adopted the Ordinance of Sheriffs (October 1258) and the Ordinance of the Magnates (February 1259). The Provisions of Oxford were replaced in 1259 by the Provisions of Westminster. These Provisions were overthrown by Henry, helped by a papal bull, in 1261, seeding the start of the Second Barons' War (1263—1267), which was won by the King and his royalist supporters. In 1266 it was annulled for the last time by the Dictum of Kenilworth. 4. With regard to the sheriff's tourn, it is provided that, unless their presence is specially demanded, archbishops, bishops, abbots, priors, earls, and barons, or other men of religion, or women, shall not of necessity come thither.... And the tourns shall be held according to the form of the king's Great Charter, and as they were customarily held in the time of the kings John and Richard. 21. Hereafter itinerant justices shall not amerce vills on their eyres because particular twelve-year-old persons do not come before sheriffs and coroners for inquests concerning a man's death or other matters pertaining to the crown; so long as, nevertheless, enough men come from those vills for satisfactorily carrying out such inquests. Following the Provisions of Westminster there was adopted the "statute" against aliens (July 1263). After the king was defeated at the Battle of Lewes he agreed to the "settlement" or Mise of Lewes (May 14, 1264) the terms of which have been lost to history, but which functioned as a kind of constitution of government going forward. This was followed by the Compromissio or Ordinatio (June 1264), known to have been made in parliament, and the Forma Pacis (August 1264). Simon De Montfort's army had met and defeated the royal forces of at the Battle of Lewes on May 14, 1264. The rebels captured the king's son and heir Prince Edward, and the subsequent treaty led to a parliament being called in 1265 to agree to a constitution formulated by De Montfort. De Montfort sent out representatives to each county and to a select list of boroughs, asking each to send two representatives. This was not the first such gathering in England, but what distinguished it was that De Montfort insisted the representatives be elected. The knights representing counties who had been summoned to some earlier Parliaments had not been required to be chosen by election. This was also the first parliament at which both knights (representing shires or counties) and burgesses (representing boroughs) were present, thereby substantially broadening representation to include new groups of society. It was also the first time that commoners attending Parliament were required to be elected. said form two of the discreet, loyal, and honest citizens and burgesses. the good men of the Cinque Ports. It first met on 20 January 1265 at Westminster Hall and was dissolved on 15 February 1265. Henry III was being held by Mortfort with a force of about 3,000 when Prince Edward, leading an army of about 10,000, met and killed Montfort at the Battle of Evesham, August 4, 1265, along with his eldest son Henry and all of his army. Many of the reform documents have been lost, presumably destroyed by the royalists. After this Parliament it took some time for the knights and burgesses to become a regular part of the composition of Parliament. The next time they were summoned was for the 1st Parliament of King Edward I of England in 1275, but parliamentary reform and representation of the commons proceeded very slowly for the next several centuries. Progress was impeded by four centuries of civil conflict among contending factions. We can speculate how the course of history might have been different had Montfort won the Battle of Evesham. Many think England might have become a republic and that England might have gone on to dominate the world four centuries sooner than it did. We might already be exploring the stars. The full Provisions of Westminster — More complete copy. Select Documents of English Constitutional History — More complete copies of both sets of Provisions. The Simon de Montfort Society — Heritage charity to preserve the legacy of Simon de Montfort and the sites connected to his life and death. Battle of Evesham, August 4, 1265 — Details on the battle including maps. Site of the Battle of Evesham — Here is where the course of history took a very wrong turn. 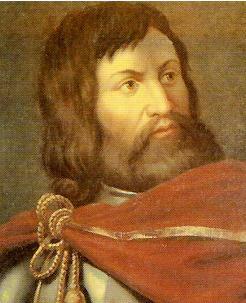 Simon de Mortfort 2014 — Honouring 750 years since his struggle. The Barons' War: Including the Battles of Lewes and Evesham (1871), Blaauw, William Henry, 1793-1870; Pearson, Charles Henry, 1830-1894 — History of the war.